There is such a lack of basic grooming education these days. It’s a shame that men aren’t being taught how to properly finish off a shave. Shaving can cause a lot of skin irritation if not done right. 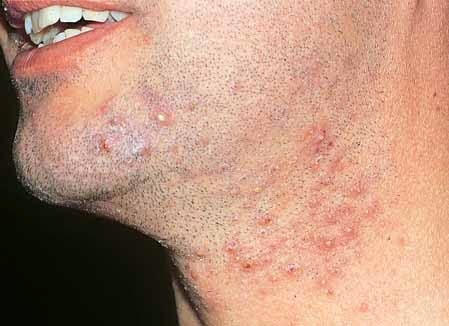 Many men find their skin breaking out in acne caused by shaving. Or maybe they just get irritation and redness caused by shaving. Either way, it’s very easy to reduce irritation and acne caused by shaving if you have the right tools. Your shave is not finished when you put down the razor. It’s finished after you splash on some aftershave. If you find yourself with irritation, ingrown hairs, or acne caused by shaving, consider adding aftershave into your shave routine. Aftershave is useful for a few reasons. Mainly, it cleans the microscopic cuts on your skin from the razor. It also ‘closes your pores’ by causing the skin tissue to contract, making your skin appear tight and toned. If you do not clean those tiny cuts and close your pores, you are leaving your skin open to irritation and infection. Dirt, sweat, hair, oil, shaving cream, etc can get in those tiny cuts and cause hell. All you need to do is splash some natural aftershave onto your skin after shaving to sterilize and tone your skin. Using aftershave will definitely make your skin look better. Especially if you are dealing with acne or other irritations caused by shaving. Yes, if you want to reduce acne caused by shaving. Yes, if you want to reduce ingrown hairs, redness and other irritation. It takes less than 30 seconds to add to your shaving routine after a shave. You should notice the benefits almost immediately. Apply a good organic and natural brand of aftershave, wait 30 minutes, and check out how great your skin looks. Think about why your skin would break out in acne after shaving. Generally, it’s due to lack of cleanliness. You’re probably just shaving with a dirty razor, dude! Shaving is science, and science requires sterility! The only pre-shave ritual you need to do is soften your beard/stubble before you shave. A dry hair is going to be tougher to shave off than a soft hair. Most of all, your razor will have a harder time cutting through the hair, which may result in pulling and tearing of the skin. This ultimately irritates your skin. A razor will glide through a softened hair like butter, provided it is sharp. Simply shave right after taking a shower, when your beard hair will be softest, or, wrap your face with a damp towel for 5 minutes before shaving. Doing this step alone should show massive results. Disposable razor blades dull almost immediately. It’s best if you use a new disposable razor every time you shave. Remember, shaving with a clean razor is key. Reusing a disposable razor is the opposite of cleanliness. Disposable razors are especially bad because their multiple blades trap hair, oil, blood, and skin. The best electric razors will have a self-cleaning docking station if you have to use one. Otherwise, they can collect dead skin, oil, hair, bacteria, and other irritants on the surface. When you shave with a dirty razor you’re taking all those irritants and putting them right in those microscopic cuts caused by shaving. Those cuts may even be bigger than microscopic if that razor is really dull. Ideally, you should shave with a straight razor, shavette, or safety razor. They are single bladed, cleaner, cheaper over your lifetime, and overall the best way to shave. Not sure how to choose a razor that is right for you? Check out our useful guide. The guide is also useful for explaining the differences between safety razors and disposable razors, straight razors and shavettes. Tl;dr To reduce acne caused by shaving, soften your beard before shaving, use a clean razor (preferably straight razor), and use aftershave when you’re done. That’s it! Looking for an all-natural aftershave? Aftershave by California Beard Company is the best aftershave for your skin.